Why do people all around the world choose to discriminate against people with Down syndrome through social media? They choose to do so through social media for their own self satisfaction. The people choosing to discriminate can hide behind their computer screens while Facebook and other social media outlets allow this to continue. The people choosing to discriminate get pleasure tormenting others. "They see the disability, not the person" (Geoginamcqueen). They choose to comment facelessly. Those who cannot accept that people are unique and sometimes different have the greater disability. Take a look at the pictures provided above. These images portray an individual with Down syndrome and an individual without Down syndrome. These humans both have eyes, noses, ears, lips, a tongue, and a face, but yet the picture of the individual with Down syndrome still receives discrimination. People discriminate against things they do not know or understand. They discriminate because they lack morals, are afraid, or they just simply do not care. 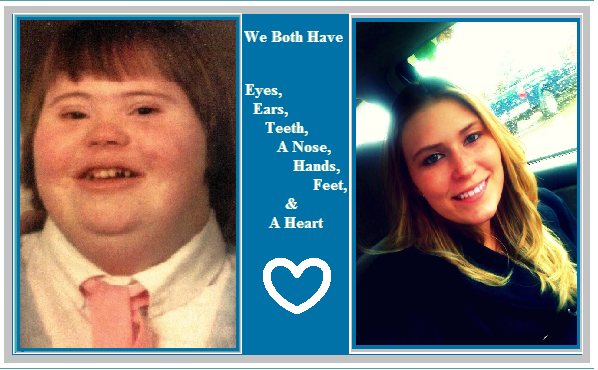 The only difference between the two individuals picture above is a genetic disorder. The one on the left has forty-seven chromosomes and the one on the right only has forty-six chromosomes. Individuals with Down syndrome do more for and with society than many of those who sit behind their computers posting discriminating comments. You must consider that people who discriminate are much like Adolph Hilter who persecuted the Jews. He did not understand their religious convictions or political views. Is cyber discrimination any different? Discrimination has been alive and well for centuries, but people now have the tools to do so anonymously. Whether a person is poor, female, African American, blind, deaf, or has Down syndrome the reaction of uneducated people is always the same. If someone is not like everyone else, and people have no interest in learning why, they can become a subject of ridicule. Discrimination laws have been published in this country for a reason. Such laws were put into place prior to social media’s existence. Our government is just now starting to adapt discrimination laws to include media organizations such as Facebook, Twitter, and others. Cyber bullying has become a hot topic in our schools, but beyond that, very little has been done to control it in our everyday lives.